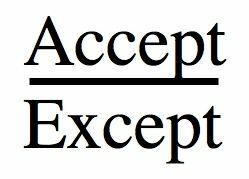 Accept means "to receive," or "agree with". Except means "to omit" or "to exempt." The two are commonly misused and often interchanged at little cost to current standard usage.